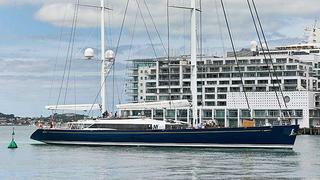 Alloy Yachts has now released more details and pictures for the 56.4m sailing yacht Mondango 3launched last week. Like her predecessor, a 51.7m sailing yacht launched by Alloy Yachts in 2008, the new yacht is Lloyd’s registered, built in aluminium and designed by the same successful duo. Dubois Naval Architects is responsible of the naval architecture and the exterior styling, while Reymond Langton has worked closely with the owners to create an innovative interior. The interior accommodates up to 11 guests in five cabins including a full-beam master suite amidship, two doubles and two twins (one with a Pullman berth). Crew quarters are forward, allowing 10 members in six cabins. Mondango 3 is powered by a single 1,450hp Caterpillar C-32 engine giving a top speed of 14 knots, a cruising speed of 12 knots, and a range of 6,500 nautical miles at 10 knots. Under sails, she should easily exceed 16 knots in optimum weather conditions. Mondango 3 is starting her sea trials. Her delivery is scheduled for February 2014.